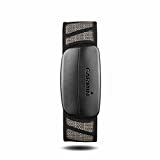 The Garmin Premium Heart Rate Monitor is a heart monitor that provides wireless data about your heart rate to a compatible wireless device of your choice, and is worn around your chest to provide a comfortable user experience without the need for a wristband. The Garmin Premium Heart Rate Monitor is also waterproof (10m/39.2ft), has a battery life of approximately 3 years per 1 hour of usage per day, and has an extreme temperature endurance from 14°F to -122°F. And it has reasonable price range at $41.49 on Amazon. The Garmin Premium Heart Rate Monitor is a simple heart rate monitor that does the job. It is optimized for use in congested areas such as gym classes and starting lines, and fits comfortably on your chest without the need for wristbands that may hook or get caught on something. It is water resistant to protect it from sweat or the occasional accidental dunk. It is not designed to read heart rates underwater but will still function once out of the water. And in the event that something does go wrong, Garmin’s customer support is known for quickly helping their customers get replacements in the event of device malfunction or defect. So while simple, the Garmin Premium Heart Rate Monitor boasts some impressive features for its price. Functionality: Has excellent reviews on lifespan and durability, and is shown to operate without issue for years. Lifespan: Has a battery life of up to 3 years at just 1 hour of use per day, and batteries are replaceable. Comfort: The Garmin Premium Heart Rate Monitor comes with a soft fabric strap for comfort and ease of use for men, women, and the elderly. Water Resistance: Water resistant of up to 10m/32.9ft. Affordability: Tops out at $59.99, which is approximately 75% less expensive than other heart rate monitors on the market. Customer Service: Garmin is known for its excellent products and excellent customer service. A majority of customers that have had technical issues with their products report fast and friendly turnaround for replacements of their products. The ability to track and log your runs via GPS. A built-in memory unit to record time, distance, and calories so that you can compare your workouts over time. Built-in accelerometer to log distance whether outdoors or indoors. The ability to program your heart rate monitor for different functions. Garmin Connect Mobile app, which allows real-time updates, automatic uploading of run data and social media sharing. While there are several heart rate monitors out in the market that do more, what this heart rate monitor offers over the others is affordability with the same basic functionality that more expensive models offer. Other expensive heart rate monitors, such as the Garmin Forerunner 220 GPS Running Watch, also displays your heart rate but also comes with a built-in GPS and accelerometer to log and record your distances, times, and heart rates over a period of time, all for the hefty price of $249.95. The nice thing however is it can be paired with other Garmin technology like the Forerunner 310XT or the Vivofit for better data tracking. And while the Garmin Forerunner and other models like it are certainly worth the money AND do deliver, the average consumer doesn’t have a need for such an advanced piece of equipment. At the end of the day, the Garmin Premium Heart Rate Monitor is an effective and functional heart rate monitor that will do the job and help you track your heart rate, and do so without the need for excessive technology or cost.